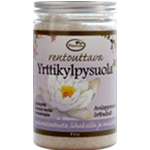 Ayurvedic bath salt for serenity and peace of mind, calming the nerves. The bath warms the body, stimulates blood circulation and at the same time cares and hydrates dry skin. It calms and relieves anxiety and nervousness and helps the ability to focus. The bath is relaxing and helps preparing for a good night of sleep. Organic herbal extracts cares for the skin and relax the body. 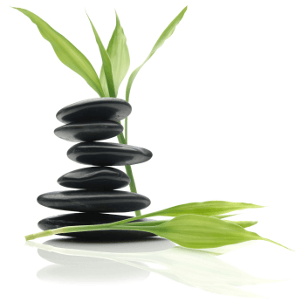 Genuine aroma-therapeutic essential oils warm the body and calm the nervous system. 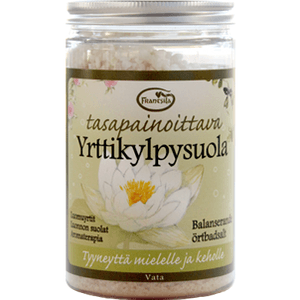 The bath salt is ideal to balance the Ayurvedic VATA type. Recommendation : enjoy the bath for 15 to 30 minutes, for foot and hand bath 10 minutes is enough. 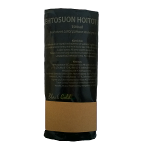 For children: use only ¼ - ½ of the adult dosage. Keep the lid well shut so that the salt stays dry. Raw materials and manufacturing meet European standards for natural cosmetics. No animal testing, animal or genetically modified substances, mineral oil, silicates, artificial colors or scents, or parabens. 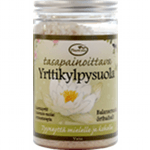 Ayurvedic bath salt for serenity and peace of mind, calms the nervousness. 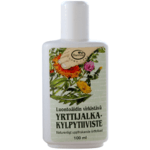 100% genuine Finnish moss and sedge peat treatment mixture. 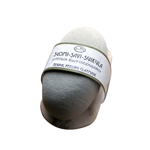 This Body Exfoliation Bar cleanses, smoothens and nurtures the skin. Excellent when coming out of the sauna or steam room. Revitalizing and refreshing Aromatherapy bath oil stimulates circulation, brings relief to tired feet and nurtures the skin. 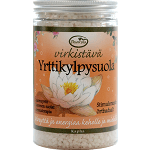 Ayurvedic bath salt brings vitality and energy to the body and mind.